The City Record and Boston News-Letter: Roxbury? South End? or Something Else? Roxbury? South End? or Something Else? Click on the modern map to see the larger version, for best results open the modern map in a new window. You can also roll your mouse over the points on the map for location details. The boundary line between Roxbury and the South End has always been a thing of controversy so I thought I would throw my opinion into the fray. I've marked a number of points on the modern day map to correspond to the 1832 map, which shows the Boston/Roxbury boundary as a dotted line, occasionally broken by a watercourse which serves as a natural boundary. Point 1 is First Church in Roxbury, which can be seen on the 1832 map as a church building. Point 4 is Magazine Street, which now terminates at Mass Ave, but on the historic map ended in the marshes of South Bay. My one sentence conclusion: Boston, but not the South End, has historically extended into some of what we now consider to be Roxbury today. Now the good stuff. First, everything east of Harrison Avenue, which is the dotted line on the historic map running parallel to Davis (now Albany) Street and south of Mass Ave is part of Roxbury. Roxbury extended to the canal to allow the town access to South Bay. Second, it would appear that Hammond Street (point number 8 on the modern map) runs along the historic dividing line between Roxbury and Boston. Point number 9 on the modern map, Westminster Street, is listed in the 1910 Record of Streets as having been part of Roxbury, point number 10, Kendall Street, is listed as being in Boston. Furthermore, Hammond Court, no longer extant, ran off of Hammond Street and is listed as a Boston street. Ball Street, number 5 on the modern map, is part of Roxbury and Thorndike Street, point number 7, is in Boston. This means roughly everything west of Harrison Avenue, south of Mass Ave, east of Tremont Street, and north of Hammond Street/Thorndike Street is historically part of Boston. What remains unclear is what to call the area. It isn't really Roxbury, having always been part of Boston, yet it really isn't the South End either, at least stylistically, because the architecture is different. I suppose a savvy real estate agent will come up with a new name soon. And while the history is clear, perception, reinforced by official designations like zip codes, will be harder to change. One side note: The 1832 map also shows that prior to the filling of the Back Bay, Roxbury's boundary extended almost all the way to the Public Garden. 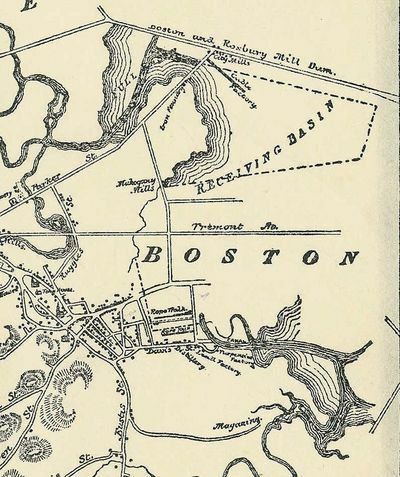 The 1788 law describing the Boston/Roxbury boundary can be found here. Credit where credit is due department: Ron Newman figured this out last December. The article correctly identifies the historical boundary between Roxbury and Boston. However, the conclusion based on architectural styles is not adequately supported. There are buildings on the Hammond Street side of Mass. Ave. that are the same architecture as buildings on the other side of Mass. Ave.(For example along Tremont Street, and also on Northampton Street.) Many other buildings are no longer extant. Over time the area called the"South End" has shifted from close to Bay Village. Considering the historic Roxbury -Boston boundary and the current BRA definition, I think Melnea Cass Blvd. is close enough to Hammond Street to be considered the South End Roxbury boundary on that side. Roxbury has been shrinking for decades. The South End, once clearly part of Roxbury, is now not associated with that neighborhood, except by a few old timers and in a few official designations. Now the South End itself is expanding and encroaching on Dudley Square-- the original center of Roxbury! Jamaica Plain, and of course, West Roxbury, were lost long ago. The Longwood Medical Area is part of Roxbury-- just call information for the Harvard Medical School and they have it listed, surprisingly, as being in Roxbury. However, Mission Hill is also part of Roxbury, not Jamaica Plain, as many students like to think. Ultimately, Roxbury will continue to shrink as realtors attempt to disassociate potential develpoment areas from a well known black community. Like it or not, racism is a big player here. Much of today's South End was once under shallow water, so it couldn't have been Roxbury, which was the mainland directly south of Boston. The Mission Hill people seem to be particularly nutty about being their own neighborhood. "Not Roxbury" is their mantra, whether inspired by racism or property values.